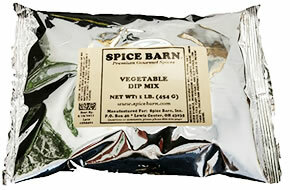 Usage: Blend 2-3 tablespoons dip mix into 1 cup sour cream and 1/2 cup mayonnaise, or to taste. Refrigerate for at least 15 minutes to blend flavors. Ingredients: Dehydrated Bell Peppers, Salt, Corn Starch, Monosodium Glutamate, Sugar, Onion, Autolyzed Yeast Extract, and Red Pepper, Less than 2% Tricalcium Phosphate added to prevent caking.